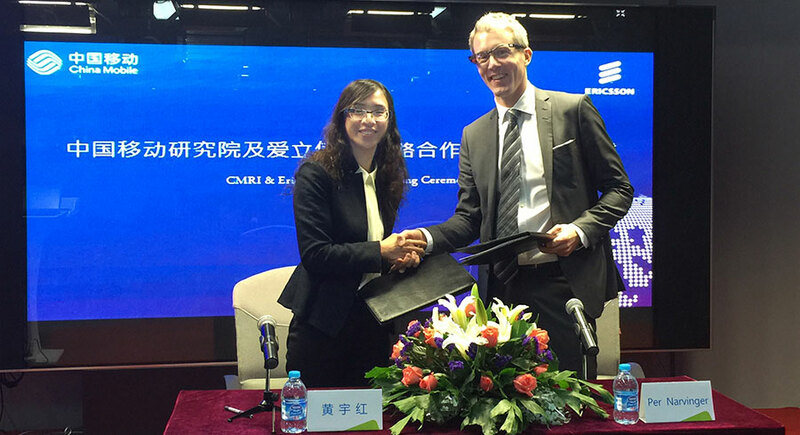 Ericsson (NASDAQ: ERIC) and China Mobile Research Institute (CMRI) have signed a Memorandum of Understanding (MoU) to collaborate on 5G research and development. The agreement will help drive innovation and early application of 5G mobile network technology. Yuhong Huang, Deputy Head, China Mobile Research Institute (CMRI), says: "China Mobile officially deployed 4G at the end of 2013, and 4G+ is now officially launched. We aim to improve network performance, which has provided 300 million customers with excellent user experiences, and which is the key driver for China's Internet+ strategy." "The Internet+ strategy is intensifying, and momentum is growing in China in relation to transformation and upgrade of traditional industrial lines and business models, by leveraging the most advanced information and communication technologies. As the next generation of mobile infrastructure, 5G is the key pillar for ICT development globally. We feel that closer and more active cooperation between Ericsson and China Mobile will foster tangible results in 5G by helping to drive standardization, research and development, and creating an integrated, cross-industry ecosystem." Chris Houghton, Head of Region North East Asia, Ericsson, says: "With commercial implementation expected from 2020, Ericsson's 5G research is coming out of the labs and into live test networks, both in our headquarters in Sweden and in collaboration with our operator partners in Northeast Asia, North America and Latin America. The MoU between Ericsson and China Mobile was signed on December 21 in Beijing, China. Ericsson is leading and driving 5G standards work - from exploratory research and pre-standard field trials, through to standardization activities together with global standards bodies and industry groups. Through key technology advances like the Ericsson 5G Radio Prototypes that include advanced antenna design, multi-user MIMO and beamforming, Ericsson and its operator customers will be key players in defining the next generation of mobile network technology all the way to commercialization. Photo: Yuhong Huang, Deputy Head of CMRI and Per Narvinger, Head of LTE, Ericsson signed the MoU. They were wearing the AR glasses which demonstrated one of the 5G use cases.